I am so ready for summer now. Exams are just around the corner for me and come the 24th of May I will be free and starting a 15 week long summer holiday! But I can’t get too complacent because after that I start law School. One of my favourite things when the weather starts to warm up is how my eating habits change. Long sunny evenings lend themselves to Alfresco dining. And all of a sudden salads fill you up like never before! I also love cooking recipes inspired from holiday’s abroad. Nothing says summer like Spanish Tapas or a delicious Italian inspired pasta dish. 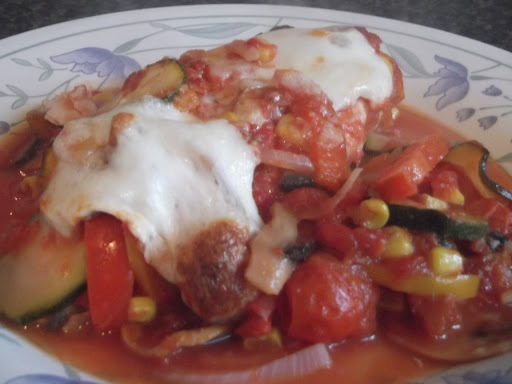 This recipe for Mozzarella Stuffed Chicken with Mediterranean Tomato Sauce is one of those! There are no stodgy carbs, just delicious Mediterranean vegetables and succulent chicken stuffed and topped with creamy mozzarella! Delicious! If you want to be swept back to memories of your holiday in the Med then this is the recipe for you. Thinly slice the vegetables and fry off in a pan until cooked through. Add the tomatoes and chopped tomatoes and simmer for five minutes. In the meantime, cut a pocket into the chicken breasts. Break the mozzarella ball into 3 parts and use 2 of the parts to stuff the chicken. Put the rest of the mozzarella to one side. 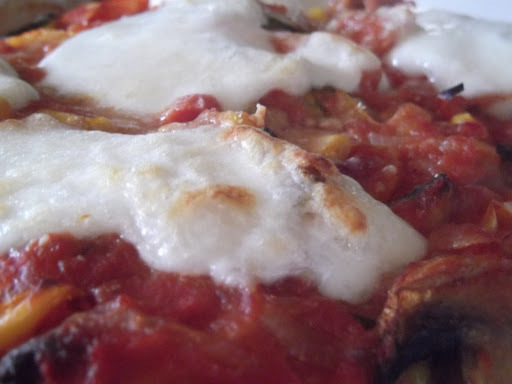 Place these in a large oven dish and pour over the tomato sauce. Bake in the oven at gas mark 5 for 30mins. Finally, place the mozzarella on top of the dish and bake for another 10mins until golden brown and starting to crisp! Thanks Xinmei you too!!! I have to admit there are pros of having my exams finished so quickly but it means they are all in a row 🙁 and none of my friends are finished until June!!! Definitely pulled the short straw haha! When do you start your job?